I did return to the Musee d’Orsay last night to discover that many of the impressionism pieces are on loan to other museums. I figured since I’d already seen those, anyway, I’d focus on the other areas of art there. I discovered a fascinating artist by the name of William Bougerau and some of his pieces may inspire a few scenes in the Zeus, Inc. sequel. Paris is full of inspiration! I also have a new obsession with sculpture that I did not possess before I arrived here. I blame the Louvre for that, but the Orsay also has some impressive pieces. Unfortunately, for me, it also kept me up late last night. Oops. This morning, though, I did drag myself out of bed at a fairly decent hour and made my way to the Basilique Cathedral de Saint-Denis. Saint Denis is interesting in that he was beheaded and apparently survived long enough to be seen carrying his head (I forget the full story – I’ll wiki it later) walking through the streets of Paris. Anyway, the cathedral sits on an old Gallo-Roman cemetary with this guy’s tomb (he was thought to have been the first Bishop of Paris). 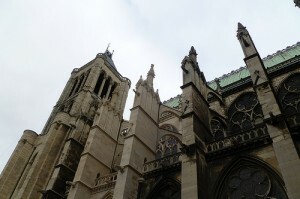 It’s a gorgeous piece of architecture and rivals Notre Dame in beauty. Also, most of France’s royalty is entombed there, including what was left of Marie Antoinette after the revolution (her remains were thrown into a mass grave with other nobility, but I think they found a finger or something to bury at Saint-Denis). It also has some gorgeous stained glass. After that, I thought I would go back to the islands and grab some lunch. There was a cafe I ate at last year that I really liked. So I did that and had more steak and frites, along with more wine. Viva la Paris! I’m not sure how I was even hungry after the religieuse caramel I had for breakfast, but I was. I ended my meal with the traditional coffee. While walking by the tourist shops, looking for souvenirs, I passed the crepe stands. And they smelled so good, that I had to have one. I was not hungry, but still scarfed down a nutella crepe! LOL I can’t stop eating!!! It’s a good thing I’m getting plenty of exercise with all this walking. I bought a few souvenirs and saw signs for the Musee of Deportation. This is a memorial for those who had been placed in internment camps during the Nazi Occupation during WWII. I cried my eyes out. It’s set up so that you sort of experience what those in the camps might have. High walls and gates. It’s very surreal. And it wasn’t only Jews that were persecuted. It was also homosexuals and gypsies and anyone else who didn’t fit into the Hitler ideal of white Christian. After all these years, the thought of it is still horrifying, as it should be. We should never forget those horrors. Obviously, it was a sobering experience. I decided to come back to the apartment for the remainder of the day. I had thought I would go back out, but I need to rest my weary feet, especially if I am to make the walking tour I want to go on tomorrow. One interesting side note – there was a photo shoot going on in the cafe where I had lunch. Some pretty blonde model was posing in some very expensive clothes while a make-up and hair stylist fussed with her. I took some ninja photos with my cell phone because she looked familiar. I believe she was American but all those models look alike to me.